Currently there are so many eye-watering stories of the desperate plight of refugees from chronic instabilty and conflict in North Africa, the Middle East and beyond attempting to reach ‘Fortress Europe’ by any and every means possible. 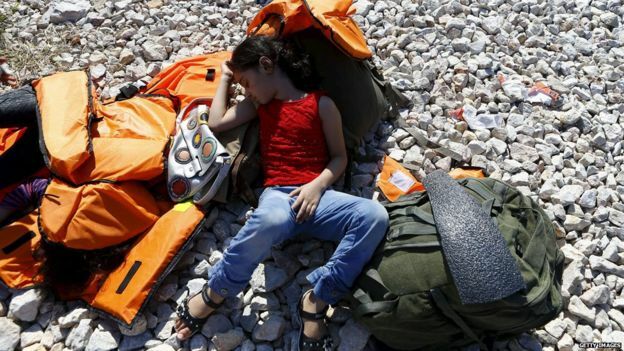 This one, a BBC News report on Syrian and Iraqi refugees attempting – and often failing – to reach Greece by boat from the Turkish coastal city of Izmir, is particularly poignant: not least for anyone who’s ever used a life-jacket for themselves, or their loved ones. The city of Izmir on Turkey’s Mediterranean coast has long been known as a tourist destination. But now people fleeing Syria’s civil war are using it as a staging post on their journey to Europe and providing shopkeepers with an unmissable business opportunity, reports the BBC’s Manveen Rana. Tourists have always flocked to Izmir, drawn by the ancient ruins and the beauty of the Aegean coast. But now the city is attracting hordes of people for a very different reason: it is fast becoming one of the largest hubs for smuggling people into Europe. In the historic centre of the city, the streets are teeming with families from Syria and Iraq, all waiting for boats to Europe. They live on pavements, railway platforms and roundabouts – anywhere where they can find space. Many of the hotels won’t give them rooms even if they can afford them. 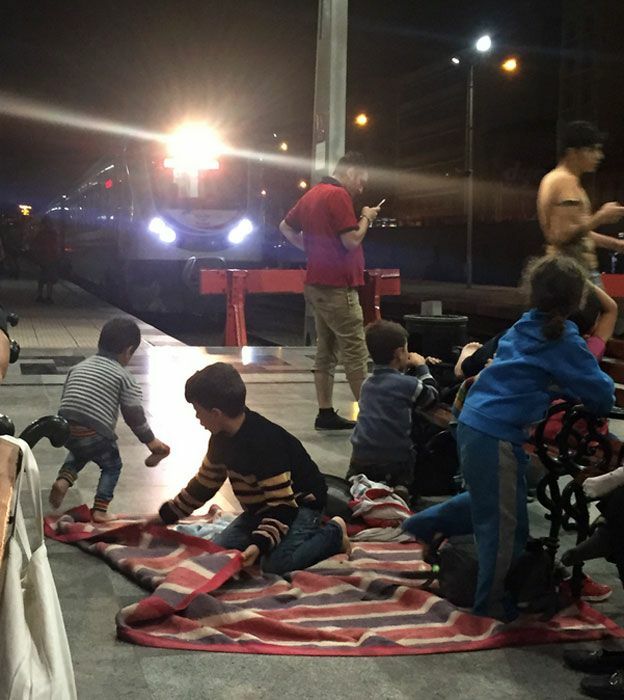 Children and babies sleep on mounds of luggage as their families gather their worldly belongings around them. Everything is wrapped up in black plastic bin bags to keep it dry on the boat journey to Greece. Nobody knows if they will leave tonight or next week. Everyone here is waiting. The residents of Izmir worry about the effect this will have on tourism, but the shops along one of the main streets have adapted fast. Whether they used to sell souvenirs, shoes, clothes or electrical goods, now they all do a roaring trade selling life jackets and buoyancy aids. The demand is huge. Not only is the journey to Greek islands in overcrowded rubber dinghies inherently risky, but most of the Syrians and Iraqis I’ve met here can’t swim. In one of the shops, I meet Mahmoud, a student from Aleppo. 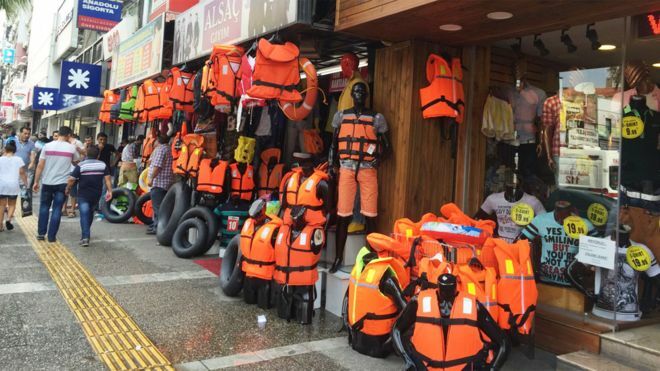 He escaped Syria a year ago and is now employed by a Turkish trader to help sell life jackets to his countrymen. “We sell between 100 and 150 a day, and more and more people are coming every day [to buy them],” he tells me. They have even started selling a new line of life jackets for babies and children. He points at another friend and laughs. “This man can’t even swim but he came on this journey. He is really very brave.” They slap each other on the back with the heady exhilaration that comes from looking death in the eye and living to tell the tale. It soon becomes apparent that the crowd can be separated into two groups – those who have already tried and failed to make the journey, and those who are still hoping to board a boat for the first time. The uninitiated still hoard bundles of black bin bags, whereas the seasoned travellers have either lost or shed the bulk of their possessions and cling only to the things they really need. It seems life can be whittled down to a few essentials – mobile phones, passports and cash. But how do you protect them if you’re faced with the prospect of swimming for hours in the sea? The answer is surprisingly simple. On the pavement outside the station, several men are selling brightly coloured balloons that haven’t been blown up. These, they assure me, will expand to hold even the largest of smart phones, and they’re completely waterproof, ensuring your phone is ready to use when you arrive in Greece. “You want yellow, red or pink?” the salesman asks me, holding out the specially modified balloons in a dazzling array of lurid colours. This makes them easier to spot if you become separated from them at sea. A few days later, I’m in Greece running to catch a ferry and almost trip on something by the water’s edge. Looking down, I find the remnants of a torn and battered, but oddly familiar, bright pink balloon. Rengin Arslan from BBC Turkish also spoke to Syrian refugees in Izmir, preparing to make the trip to nearby Greek islands.